Easily Earn lots of Rewards and Amazon Gift Cards with Varying Offers for Simple Online Things You Do Every day. 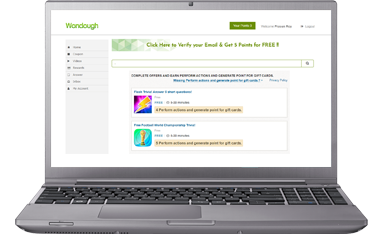 Earn Wondough E-points for successfully completing simple online Tasks. Find offers and Best deal to Earn Best Rewards. Earn Enough Wondough E-Points to successfully redeem them to get Free Amazon Gift Cards and Shop on Amazon Without any Hassle. Share Your Thoughts and Opinions on simple topics and Take Surveys to Start complimenting Your Thoughts. 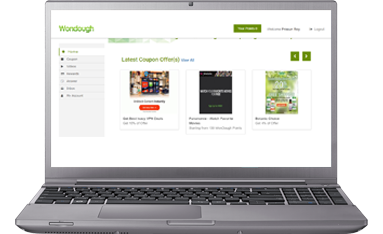 Earn Wondough E-Points on completion of Simple Tasks and Accumulate them to grab awesome Offers too. Wondough Comprises awesome offers with special Amazon Gift Cards as well other special gifts and offers. Scamper through our best offers and win cash reward for it.